Venice, Italy—February 21, 2019—Ocean Space, a new collaborative platform for change, will launch its first phase this March. Initiated by TBA21–Academy, this new embassy for the oceans will catalyze transdisciplinary research and foster collective action, encouraging audiences to radically reimagine how we see and treat the defining feature of our blue planet. 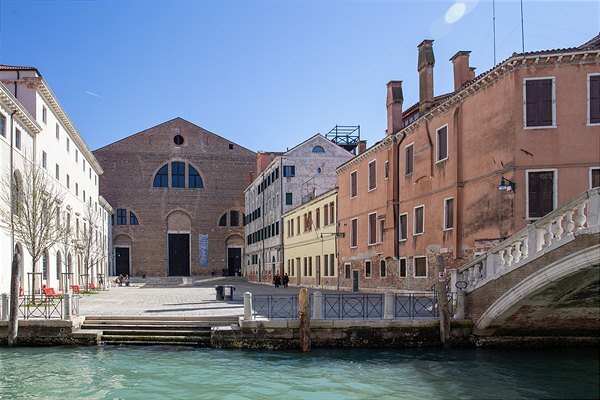 Located in the Church of San Lorenzo in Venice, Italy, Ocean Space reintegrates the historic building back into the cultural fabric of the city, after two years of conservation and renewal, and more than 100 years of being largely closed to the public. 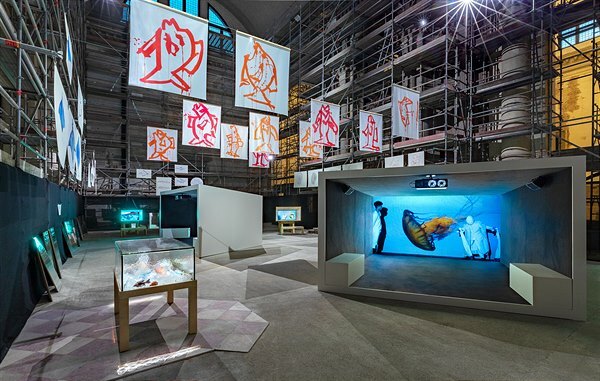 To inaugurate Ocean Space, TBA21–Academy presents an immersive multimedia installation by the acclaimed artist Joan Jonas, the culmination of three years of intensive research and explorations with the nomadic academy. Moving Off the Land II is curated by Stefanie Hessler, and on view from March 24 through September 29, 2019. The opening program will include a conversation between Jonas and Dr. Sylvia Earle, marine biologist and National Geographic Explorer-in-Residence, moderated by Hessler; and a discussion between Francesca Thyssen-Bornemisza, founder of TBA21, which oversaw the revitalization of the Church of San Lorenzo, and Jorge Otero-Pailos, Professor and Director of Historic Preservation at the Graduate School of Architecture Planning and Preservation at Columbia University. In early May, coinciding with the vernissage of the Venice Biennale, Ocean Space will host a series of special performances and presentations, including a performance by Jonas on May 7 that builds on themes explored in the installation. Following the closure of Moving Off the Land II, Ocean Space will undergo additional work on its interior to create a dynamic structure of platforms and flexible spaces, designed by architect Andrés Jaque from the Office for Political Innovation. Ocean Space’s program will relaunch next spring, with work on its interior design expected to be completed over the next two years. “We selected Venice for this new embassy for the oceans as it has long been a center for international exchange. Historically, the city served as a critical hub for trade and the navigation of the high seas. Today, it struggles alongside numerous other coastal communities and island states the effects of climate change and sea level rise, making the mission and program of Ocean Space ever more topical to the local community and its visitors,” stated Co-Founder Francesca Thyssen-Bornemisza. Ocean Space builds on the expansive work of TBA21–Academy, which since its founding in 2011 has engaged leading artists, scientists, policy-makers, and influential leadership from climate-change hotspots in residencies, expeditions, and public workshops worldwide. The new center will offer a public platform for research, projects, and initiatives by TBA21–Academy and partners in Venice and from around the world, including arts organizations, museums, universities, NGOs, and government agencies—helping to bring new urgency to issues related to the environment and catalyze ocean literacy, research, and advocacy. Ocean Space will also provide outreach and educational programming tailored for the Venice community and designed to further connect the city and its citizens with the sea. 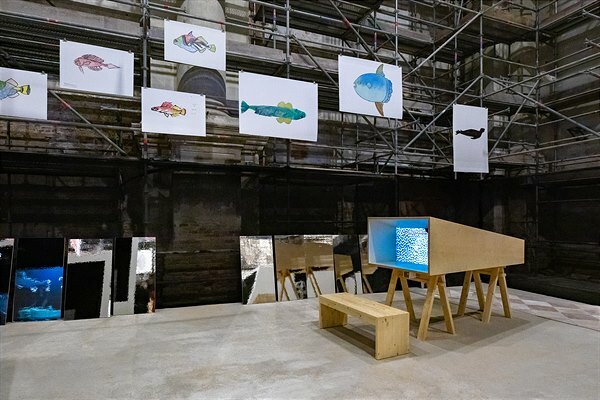 Commissioned by TBA21–Academy and building on the artist’s recent performance work and research on the seas, Moving Off the Land II (2019) pays tribute to the oceans and their creatures, biodiversity, and delicate ecology. On view at Ocean Space from March 24 through September 29, 2019, and curated by Stefanie Hessler, the installation brings together drawings, sculptures, video installations, and sound works centering on the oceans as a totemic, spiritual, and ecological touchstone. Moving Off the Land II interweaves prose by writers like Emily Dickinson and Herman Melville and texts by Rachel Carson and Sy Montgomery, with moving images from Jonas’ residency at TBA21–Academy’s scientific and conservation partner, Alligator Head Foundation, in Portland, Jamaica, as well as from aquariums from around the world. In addition to these recordings, David Gruber, Presidential Professor of Biology and Environmental Science at Baruch College and coral reef and photosynthesis expert, has shared with Jonas his captivating underwater footage that focuses on bioluminescence. Threading together this material, Jonas imbues contemporary science and observational knowledge in her poetic and evocative presentation. With Moving Off the Land II, Jonas deconstructs and translates her mesmerizing performance Moving Off the Land (2016–ongoing), also commissioned by TBA21–Academy. Jonas will perform the work, accompanied live by the acclaimed composer and drummer Ikue Mori, at the Ocean Space on May 7, during the opening days of the 58th Venice Biennale. Moving Off the Land been previously performed in parallel to the Kochi Biennale in 2016; at Sequences VIII in Reykjavik and TBA21–Augarten, both in 2017; during the artist’s retrospective at the Tate Modern, London and at Danspace Project in New York, both in 2018; and at Fort Mason Center for Arts & Culture, San Francisco, in January 2019. In conjunction with Jonas’ exhibition at Ocean Space, architect Andrés Jaque from the Office for Political Innovation has created a series of modular and mobile benches and seats, which allows for the creation of organic seating structures within the installation. In addition, select archival and research materials relating to the project, including exclusive interviews with the artist and videos of previous and related works, will be accessible online through Ocean Archive (oceanarchive.io). Launching in complete form in September 2019, this new digital platform is a “colaboratory” operating at the intersection of scientific inquiry, artistic intelligence, and environmental advocacy that compiles oceanic projects from around the world. Ocean Archive is developed by User Group, Inc., and initiated by TBA21–Academy. 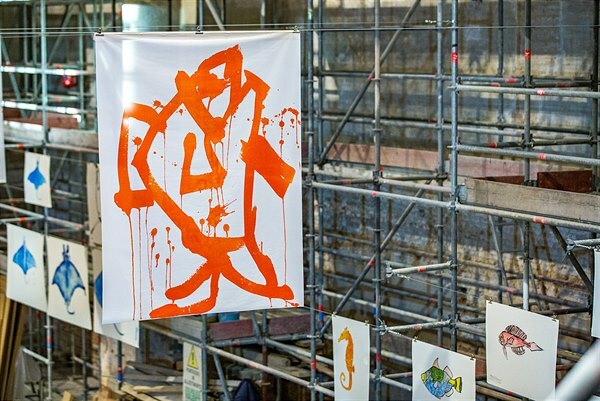 Moving Off the Land II is commissioned by TBA21–Academy and co-produced with Luma Foundation. Recognizable by its rough, unfinished façade, and fabled as the final resting ground for Marco Polo, the Church of San Lorenzo dates back to the ninth century. The current structure was built in the late 16th century (1592 – 1602) according to designs by architect Simone Sorella. Inside, a three-bay screen and a rare and resplendent, two-sided altar—designed in 1620 by Gerolamo Campaign—bifurcate the massive interior volume. Over the centuries San Lorenzo was known as a center for music, where celebrated 17th-century composer Antonio Vivaldi, who was born in Venice, both performed and rehearsed. The church suffered damages during the Napoleonic war and, in 1810, was deconsecrated and all decorations except the main altar were removed. It closed to the public in 1865 and, in the early 20th century, underwent a series of archeological excavations, in search for the remains of Marco Polo. In 2016, TBA21–Academy secured a long-term lease of the San Lorenzo, with the goal of building a new type of cultural and research center, returning the structure to the community for sustained active use. Key work included the major stabilization and consolidation of the edifice, a complete replacement of the ceiling, and backfilling of the floor in such a way as to protect the previous archeological excavations. The building project is being overseen by restoration expert Gionata Rizzi, together with engineer Franco Pianon. Outside of few public events, the Church of San Lorenzo has been closed for more than a century. For many, the opening of Ocean Space will be the first moment in living memory when it will be possible to experience this magnificent and enigmatic architectural structure. Following the closure of Moving Off the Land II, Ocean Space will undergo additional work on its interior to support its transformation into a dynamic transdisciplinary hub for oceanic research and innovation. The interior architectural intervention, designed by architect Andrés Jaque / Office for Political Innovation, will begin construction in October 2019 and is expected to be complete within two years. Jacque’s design envisions Ocean Space as an immersive access point to the oceans. Taking advantage of the soaring vertical space within the Church of San Lorenzo, the project will create a modular and highly flexible structure of platforms that allow for a range of potential exhibitions, installations, workshops, and research to be enacted within the space. 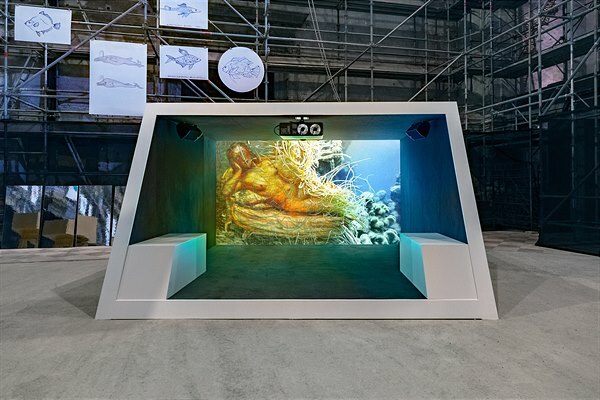 A physical reminder of the urgency of the oceanic issues and taking into consideration climate-change modelling, the flexible design will create an immersive space for exchange and advocacy that invites collaborators to consider the ocean a participant in its discussion and decision-making. TBA21–Academy leads artists, scientists, and thought-leaders on expeditions of collaborative discovery, fostering a deeper understanding of the ocean through the lens of art and engendering creative solutions to its most pressing issues. Founded in 2011, the itinerant Academy commissions transdisciplinary research that catalyzes engagement, stimulates new knowledge, and inspires artistic production. TBA21–Academy’s program is informed by a belief in the power of exchange between disciplines and in the ability of the arts as a vessel for communication, change, and action. • academic partners including Max Planck Institute, NTNU Trondheim, University of the West Indies Mona, NTU Singapore, the University of the South Pacific, and MIT. TBA21–Academy’s expedition program and unique approach was instrumental in the development of the Alligator Head Foundation, which manages the East Portland Fish Sanctuary in Jamaica, houses a marine lab and TBA21–Academy’s residency program. The Academy is the first and only arts organization to be granted observer status at the International Seabed Authority, the UN body located in Kingston, Jamaica. TBA21–Academy is a nonprofit, non-collecting research organization, supported by individuals, foundations, universities, government agencies, and corporate philanthropies. 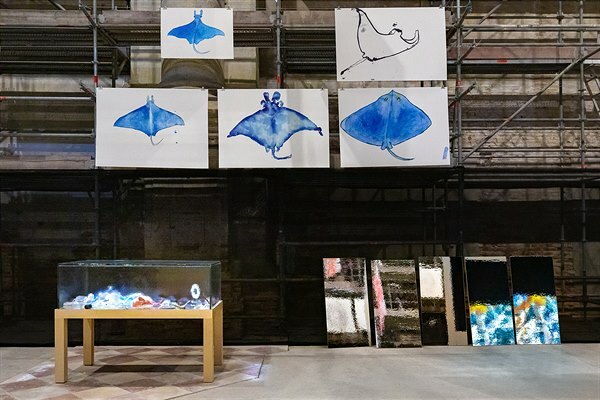 Joan Jonas, Moving Off the Land II, at Ocean Space, Chiesa di San Lorenzo, 2019. Moving Off the Land II is commissioned by TBA21–Academy and co-produced with Luma Foundation. 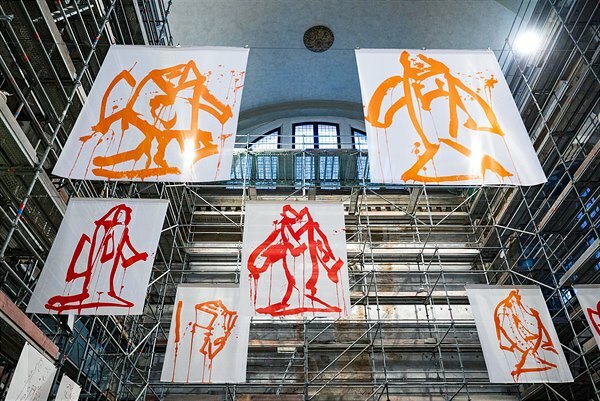 Joan Jonas, Moving Off the Land II, at Ocean Space, Chiesa di San Lorenzo, 2019, work in progress. Moving Off the Land II is commissioned by TBA21–Academy and co-produced with Luma Foundation. 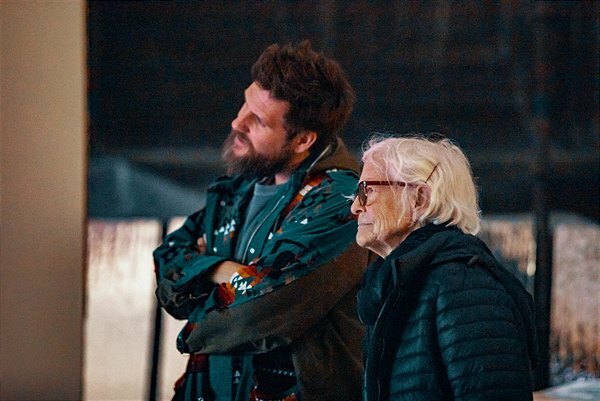 Markus Reymann, Director of TBA21–Academy, with Joan Jonas during installation of Moving Off the Land II, Ocean Space, Chiesa di San Lorenzo, 2019.